Compassionate Lord, we pray for those who have been devastated by recent flooding in the Spirit Catholic Radio listening area. We remember those who have lost their lives so suddenly. We hold in our hearts the families forever changed by grief and loss. Bring them consolation and comfort. We pray for the temporal needs of the people affected by these natural disasters…that they are able to gain access to the resources they need most. We pray for the spiritual needs of these people as well–that they may remain hopeful and cling to You. God we ask for your blessing and protection upon all these people, their homes, their farms and ranches and their animals. And for the law enforcement, first responders, volunteers, community leaders, state leaders and anyone else working to help during this time. We ask for your strength and guidance as communities begin to pick up the pieces in the aftermath of the flooding. Almighty Father, we humbly ask for you to wrap your loving arms around the heartland at this time. In Jesus’ name we pray. Amen. Spirit Catholic Radio provides coverage to the state of Nebraska and Western Iowa. We have studios in Omaha and Lincoln; towers across Nebraska; and staff located in communities from Central Nebraska to Council Bluffs, Iowa. Please know that the entire Spirit Catholic Radio team is praying for those affected by the devastating floods. If you would like additional, specific prayers, please click here to submit a special prayer request. 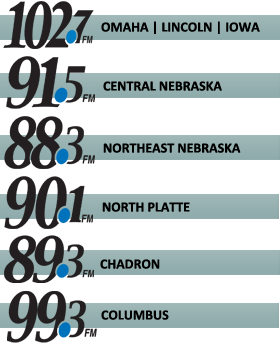 Spirit Catholic Radio is a member of the Nebraska Broadcast Association (NBA). 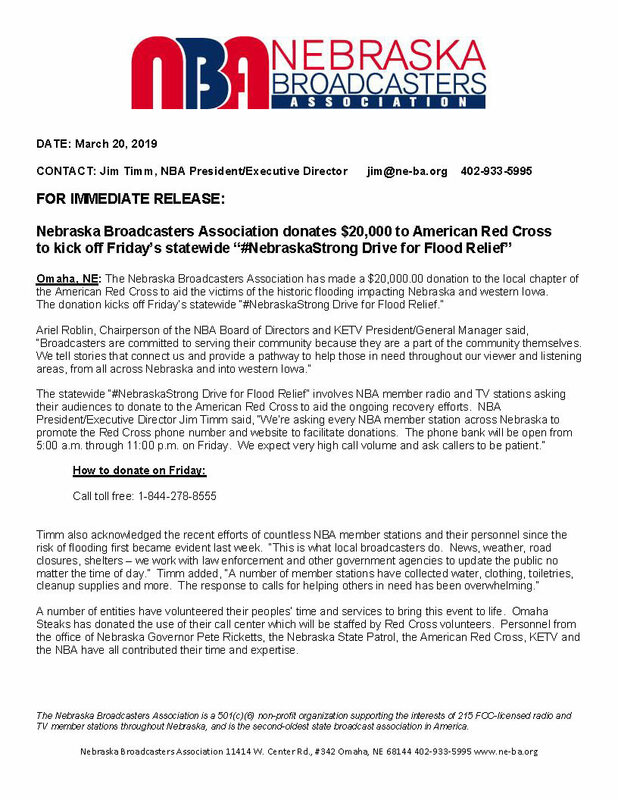 In coordination with the office of Governor Ricketts and the Nebraska State Patrol, the NBA is developing plans for a 24-hour statewide fundraising effort, likely to be held on Friday, March 22. We’re planning to participate in this drive and will share details as soon as they are available. As members of the Nebraska Broadcasters Association, Spirit Catholic Radio is participating in the promotion of tomorrow’s fundraiser, which can be read about below. Please prayerfully consider supporting this cause. The effects of the historic flood across Nebraska are devastating and far-reaching. This weekend, flood waters have inundated the north end of the City of Peru. That water has overrun the water treatment plant. Today, in partnership with county and state agencies, the City has arranged for water from Auburn to be transported to Peru in certified-sanitary tanker trucks. Water in the tower will be replenished until the water treatment plant is restored to operation. The City of Peru has issued a boil order after additional water supplies have been added to the Peru water tower. A boil order is issued anytime new water is added to a public water system. The City has asked that the public use municipal water to wash clothes, take showers, etc. but drink bottled water. The City has also asked that water be conserved whenever possible due to the expense of trucking in clean water. Starting at 10:00 AM this morning, Catholic Social Services is holding an urgent bottled water drive for the Peru community. You can bring your donated bottled water to our location at 2241 O Street in Lincoln. We want to fill a CSS trailer and deliver it to Peru tomorrow. We will be accepting donations of bottle water until 7:00 PM tonight. We understand that Lincolnites are being asked to conserve water. We are all working together to use this precious resource in a prudent manner. We are all called to live our Christian lives by using and conserving what we need and help those who have nothing. Perhaps if you are purchasing water for you and your family, you can purchase and donate a like amount for the residents of Peru. March 18, 2019 (Omaha, Neb.) – The Archdiocese of Omaha is holding a special collection at this weekend’s Masses to help offset the damage arising from severe flooding in northeast Nebraska. Deacon Tim McNeil, spokesman for the archdiocese, said pastors were asked to conduct a needs assessment in their communities. Based on that evaluation, pastors can request funds from the archdiocese to aid in short- and long-term rebuilding and recovery efforts. “Grants may be distributed to purchase water, food, shelter, cleaning supplies, tools, building materials, and tuition assistance for displaced employees,” McNeil said. McNeil said archdiocesan funds will not be restricted to parishes and their immediate needs. He said pastors can request funds to help with communitywide recovery programs. CSS is accepting donations for their assistance to the victims of flooding. Click here to learn more. The Red Cross has stations set up across Nebraska in response to the flooding. A spokesperson for the Red Cross suggests that monetary donations are needed more than materials at this point, as the material goods are harder to manage and distribute. Area residents can donate at redcross.org/local/nebraska. We will continue compiling lists of ways to help and post them here.